"A woman with a foot in both worlds"
Angela Cervantes is an award-winning author whose debut book, Gaby, Lost and Found (Scholastic 2013), was named Best Youth Chapter book by the International Latino Book Awards and a Bank Street College of Education’s Best Books of 2014. 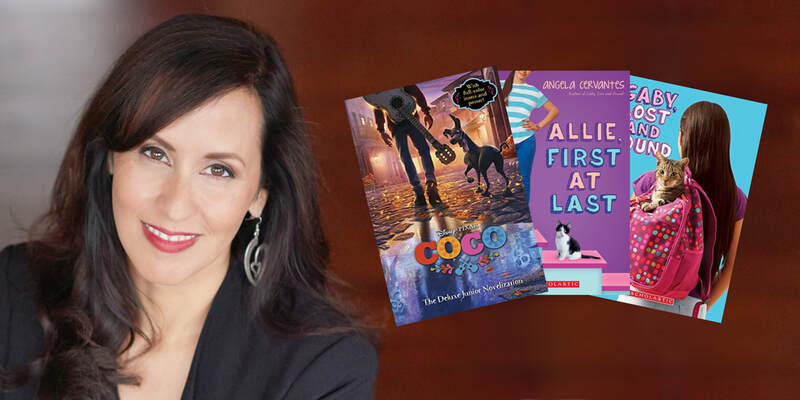 Angela is also the author of Allie, First At Last (Scholastic 2016), Coco: The Junior Novelization (RH / Disney 2017), and the soon to be available novel, Me, Frida and the Secret of the Peacock Ring (Scholastic 2018). GERALD PADILLA: Thank you Angela for being on Latino Book Review, and congratulations for all of your literary achievements. ANGELA CERVANTES: Thanks for inviting me to chat. GERALD: You were born and raised in Kansas but have also lived in Guadalajara and South Texas. Can you share a bit about your heritage and how it has played a role in shaping your literary journey? ANGELA: I was raised in a Mexican American/Chicano community in Topeka, Kansas known as “Oakland.” I’m very proud to be from this community because it was an awesome place to grow up. What made it so great was that everyone celebrated Mexican heritage and traditions right along side U.S. holidays and traditions. I was never raised feeling like I had to choose between celebrating July 4th or September 16th. We proudly celebrated both with the same gusto. Nor was I ever raised to be confused about my identity. There’s a line from Cherríe Moraga in her essay “La Güera” that I love and it sort of sums up my upbringing and mindset. It goes, “I am a woman with a foot in both worlds; and I refuse the split.” This idea shapes my stories. In South Texas, I loved how easily folks switched between Spanish and English. I admired, what seemed to me, their effortless bilingualism. I also witnessed the dynamics between how some Mexican Americans felt about the Mexicanos across the border. I remember being shocked when I heard jokes about Mexicans from the mouths of Mexican Americans. It both confused and angered me. I wasn’t accustomed to that form of anti-Mexican sentiment from people whose families came from Mexico. In my community, our elders spoke of Mexico lovingly and we were raised to be proud of our heritage and generous to those who were newly arrived. Later, I moved to Mexico. My grandparents were originally from Jalisco so I moved to Guadalajara to break away from Kansas for a little and to learn more about where my family was from. After almost three years there, I didn’t want to leave. My writing was freed in Guadalajara. I wrote constantly. When I had to return to Kansas, I remember making a promise to myself that I’d make the most of my return. It wouldn’t be for nothing. I would finish the stories I started in Guadalajara and send them out for publication. Five years later, I finished my first middle grade novel, Gaby, Lost and Found. GERALD: When did you decide you wanted to become a professional writer, and how did you react when you received your first publishing offer? ANGELA: From a very early age, I knew I wanted to be a writer. I began writing poetry, short stories and novels at around eight years old. I completed my first novel when I was ten years old. It was a sequel to the C.S. Lewis’ Narnia Chronicle books and included Mexican American characters named Princess Esperanza de Castillo and Captain Javi Sepulveda. I knew very early on that there was nothing else in the world I wanted to be other than a writer. So when I received the offer for my first middle grade novel, Gaby, Lost and Found, I was ecstatic, but also a bit cautious. I didn’t want to celebrate it until I had an actual signed contract in my hands. I was so certain Scholastic would come back to me and say they’d made a mistake and meant to contact another author. I thought it was too good to be true, but in this case it turned out to be true. GERALD: In your book, Gaby, Lost and Found, we read about a sweet girl’s love for animals. However, we also find Gaby’s tender dreams juxtaposed with the distressing deportation of her mother. What message would you give to the children in our community who, like Gaby, are faced with the painful reality of being separated from their parents due to similar circumstances? ANGELA: As I wrote Gaby, Lost and Found, I had hoped that this story would become quickly outdated; meaning that we’d have humane immigration reform in this country. I was hoping it’d be one of these books, folks would look back at and say “we can never go back to that whole mess of tearing families apart,” but alas…it’s still very real. In the acknowledgement, I included a special message “to all the Gaby’s out there” letting them know that I hoped I’d done their story justice and to “stay strong.” I still receive letters and e-mails from children and parents in similar situations as Gaby. I always write back to them to make sure they know that they’re not invisible to me. GERALD: In your second novel, Allie, First at Last, we read about a young girl’s deep desire to be first at something–a winner like the rest of her successful family members. In a society where we are encouraged to seek excellence in everything we do, where do you draw the line when it comes to passionately following your dreams and maintaining a sense of balance? ANGELA: This is a tough question. The best way I can answer this is to say that I have my own vision of what success is for me. It doesn’t involve awards or earning lots of money off of my books. I don’t believe anyone becomes a writer to make money. If they do, they’ll be disappointed. My vision is all about the children and my comunidad. I’ve worked for so long to become a published writer because I wanted to tell the stories of my community for kids like me who crave books, but are tired of same stories that render them invisible or depict them as the constant spicy-feisty sidekick. I’ve now contributed five middle grade novels featuring brave, funny and flawed Latina protagonists to children’s literature. That’s five more books than I had growing up. That, to me, is success. Success is filling that bookshelf with diverse Latino characters and stories that children are excited to read. With that vision and purpose, the line is very clear for me. GERALD: This year, the Disney/Pixar movie Coco came out and has since been an incredible success worldwide. It is the story of Miguel, a young boy, who wishes to follow his dreams as a musician despite the objections of his family members. This year, you also became the author of the book, Coco: The Junior Novelization published by RH/Disney. How do you feel to be part of such a wonderful and internationally-acclaimed story? ANGELA: Coco is such a beautiful story and movie. I was lucky enough to have viewed the script in advance and attend the Hollywood premiere for the movie. After seeing it at the premiere, I held a special showing of it in my hometown. I filled the theater with all my friends and family because I wanted every brown kid I knew to see themselves on the big screen. That, to me, was the true beauty of the film and why I agreed to write the junior novel. At a time when the President of the United States is stirring up anti-Mexican and anti-immigrant sentiment, this beautiful film honors Mexican traditions, family and music. It couldn’t have come at a better time. I'm proud to be part of Coco in my own small way with the junior novelization. GERALD: Can you tell us about your upcoming book, Me, Frida and the Secret of the Peacock Ring? ANGELA: Sure! Me, Frida and The Secret of the Peacock Ring is my tribute to Mexico and the students I taught while I lived in Guadalajara. It’s a middle grade mystery novel that centers around twelve-year-old Paloma Marquez. She is a Kansas girl who accompanies her mom on a four-week trip to Coyoacan, Mexico. While there, Paloma is quickly entangled in a mystery involving a missing piece of jewelry that once belonged to the artist Frida Kahlo. The idea for the novel came from my reading Frida: A Biography of Frida Kahlo by Hayden Herrera. In the biography, there is a section that notes that Kahlo wanted to make a peacock ring for herself. It continues that Kahlo even went so far as to collect “little stones” for the ring. I was fascinated by this detail and began searching for the peacock ring in every photograph of the artist I could find. Despite the fact that Kahlo often wore several elaborate rings, I never spotted the peacock ring among them. I wondered… did she ever finish making the ring? If so, where was it. This led me to Kahlo’s home, La Casa Azul, in Coyoacán, Mexico. At La Casa Azul, I didn’t find any clues about the peacock ring, but I did learn something even more tantalizing. After Frida Kahlo died in 1954, her husband, Diego Rivera, placed many of Kahlo’s personal items into a bathroom near her studio. He ordered it locked and it remained sealed until 2002. GERALD: In recent decades, our Latino community has been making remarkable strides in the arts and academics. What are your hopes for Latino literature in the near future? ANGELA: Yes, I agree. There have been some remarkable achievements. I’m grateful to our Latino literature pioneers who, for so many years, pushed and shoved the doors open for Latino writers and literature. They’ve worked tirelessly with their words, art and lives to prove that our stories belong in the classrooms, on library bookshelves and on award lists. Just off my head, I’m thinking of writers like Gloria Anzaldúa, Pat Mora, Rudolfo Anaya, Julia Alvarez, Esmeralda Santiago, Sandra Cisneros and Gary Soto…the list goes on and on. My hope for the near future is that the new generation of Latino authors continue to widen that opening for more Latino authors to have their chance to tell their unique stories. I’m looking forward to doing my part by mentoring emerging voices in 2018. GERALD: Thank you once more Angela for being with us on Latino Book Review. ANGELA: You’re welcome! Thank you for your work with the Latino Book Review and spotlighting new Latino voices in literature.